The final step in your training preparation is to be aware of the overall Wing Chun Concepts Training Methodology. As you've seen in the Ignition section, we've already narrowed down the material to the most effective elements. Then, in the Training Schedule section, we have established guidelines to make your practice sustainable. Now we're going to fine-tune one final element: efficiency. If effectiveness is doing the right things, efficiency is doing things right. The training process as outlined in this guide is designed to cultivate maximum skill in Wing Chun Kung Fu in the minimum amount of time and with the least possible impact on the rest of your daily schedule. Some Kung Fu masters have said that it takes 20 years to learn their system. That's a horrible return-on-investment. Our goal is to make you proficient in Wing Chun in TWO years. The Wing Chun Concepts system is based on a time-tested training algorithm that produces repeatable success in efficiently training Wing Chun concepts and skill. In order to accomplish this, each and every training session will include three phases: Absorb, Practice and Evaluate. The first time that you are exposed to a new concept, you will need to fully understand both the mechanical actions as well as the underlying key concepts. In class, each lesson will be fully explained and demonstrated by an instructor or senior student. Online, each lesson will be fully documented for reference or home study, adding photos and illustrations, slideshows or video, and supplemental information or links as needed. After you have grasped they key points of the lesson, you will put them into practice by working on the forms, doing solo drills, cooperatively working through partner drills, or testing your reactions through tactical drills. In class, an instructor will guide you through the initial rounds of practice and provide ongoing corrections. You will work with multiple partners to get a feel for the differing body sizes, strength and energy levels. Online, each practice is fully documented for you to be able to practice on your own. Most practice drills will require a training partner, but solo drills are included where appropriate. In class there are two forms of evaluation: self-evaluation and instructor evaluation. In the case of home study, you will have to rely on self-evaluation. For your self-evaluation, we recommend maintaining a Training Journal. This can simply be a notebook where you write down your observations from the current session, and/or make notes to yourself for the next session. This provides a feedback loop that allows you to course-correct or fine-tune as needed. Even if you know you'll remember what you've learned, writing it down – being forced to articulate your thoughts – activates another region of your brain and helps reinforce the learning. The sweet spot: that productive, uncomfortable terrain located just beyond our current abilities, where our reach exceeds our grasp. Deep practice is not simply about struggling; it's about seeking a particular struggle, which involves a cycle of distinct actions. Deep Practice isn't something that can be summed up in a paragraph, but rather a specific learning skill that we are going to integrate into each and every lesson. The key phrase to remember: If it doesn't challenge you, it doesn't change you. The final step in the efficient approach to training is the very specific format for all of the online lessons to follow. All of the pages that teach forms, drills or tactics will follow the streamlined format detailed below. 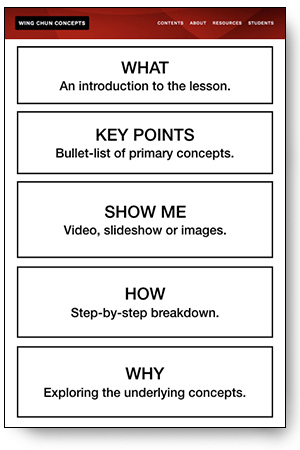 The first section gives a concise overview of the lesson so that you know exactly what will be covered. The main steps of each form, the important training points of each drill, or the key strategies of each tactics drill are listed here in bullet-list format. It is recommended that you copy these to your training journal as a way to reinforce memory and recall. By the time you mark the lesson "complete," you should be able to easily recall from memory all of the key points listed here. If you cannot, this is a sure sign that you need to invest additional practice time before you advance to the next lesson. Each form and drill will be illustrated with either photographs, illustrations, a slideshow sequence or video. The more complex the form or drill, the more detailed this visual reference section will be. As the main content of the lesson, each section of the form or variation of the drill will be broken down into easy-to-follow steps. Each movement will be fully explained, along with specific safety notes and guidelines for self-evaluation. The final section digs a little deeper for those who need to understand the meaning behind the movement. Be warned, this section may veer into topics as diverse as sports physiology, Asian symbolism, philosophy, physics, Qi energetics, Chinese medicine, and human anatomy. One you have completed the registration process with Wing Chun Concepts, you'll be given a login and password to access the Student Dashboard. This is where you will track your progress through the levels, bookmark your current training module, and find links to all lessons through your current access level. In the Foundation level you'll also be directed to our Getting Started Guide which illustrates the recommended best practices for tracking your training and progressing through the course material. That's it for the preparation work. You are now ready to begin training Wing Chun Kung Fu. Take a deep breath, shake off any tension, and get ready to step into the kwoon (training hall). Click the Student Registration button to create your account, log in and begin your journey.